Heterogenite: Mineral information, data and localities. The formula HCoO2 may be more correct (see below). From the Greek for "of another kind", as the mineral differs in composition from similar minerals. "Heterogenite is commonly referred in mineralogy literature as a cobalt oxy-hydroxide CoO(OH). However, detailed analysis of Raman and infrared spectra acquired on particularly well-crystallized natural samples of heterogenite suggests that the mineral can be characterized by a delafossite-type structure, with a general chemical formula ABO2. Indeed, the Raman spectrum of heterogenite, along the one with grimaldiite (HCrO2), lacks visible free OH-group vibrational modes, while the infrared spectrum shows strong hydrogen bond absorption bands. HCoO2 is thus a better formulation of heterogenite that describes more clearly its vibrational behavior and avoids the confusion in literature. Electronic backscattered diffraction (EBSD) is then used to distinguish and map the 2H and 3R heterogenite natural polytypes for the first time. The comparison of EBSD and Raman mappings clearly indicates that the 2H polytype is characterized by an additional peak at 1220 cm−1. The presence/absence is therefore an efficient tool to distinguish both polytypes." Heubachite A variety of Heterogenite rich in nickel. 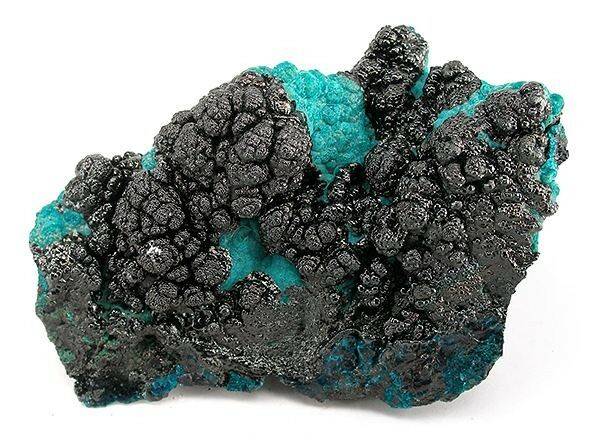 First described from Anton Mine, Heubach Valley, Wittichen, Schenkenzell, Black Forest, Baden-Württemberg, Germany. Chrysocolla 70 photos of Heterogenite associated with Chrysocolla on mindat.org. 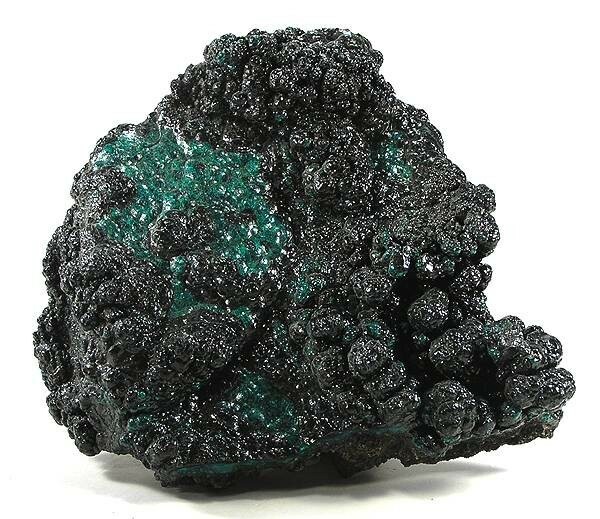 Malachite 44 photos of Heterogenite associated with Malachite on mindat.org. Roselite 19 photos of Heterogenite associated with Roselite on mindat.org. Erythrite 18 photos of Heterogenite associated with Erythrite on mindat.org. Cornetite 15 photos of Heterogenite associated with Cornetite on mindat.org. Cobaltoan Calcite 11 photos of Heterogenite associated with Cobaltoan Calcite on mindat.org. Torbernite 11 photos of Heterogenite associated with Torbernite on mindat.org. Quartz 11 photos of Heterogenite associated with Quartz on mindat.org. Smolyaninovite 9 photos of Heterogenite associated with Smolyaninovite on mindat.org. Curite 9 photos of Heterogenite associated with Curite on mindat.org. 7.21.4 Asbolane (Ni,Co)2-xMn4+(O,OH)4 · nH2O Hex. Frenzel (1872), Journal für praktische Chemie, Leipzig: 5: 404. Schoep and Cuvelier (1929), Société géologique de Belgique, Liége, Bulletin: 39: 74. Schneiderhöhn and Ramdohr (1931): 2: 558.
de Leenheer (1935), Natuurkundig Tijdschrift voor Nederlandsch-Indie: 17: 44, 148.
de Leenheer (1938), Zbl. Min. : 281. Palache, Charles, Harry Berman & Clifford Frondel (1944), The System of Mineralogy of James Dwight Dana and Edward Salisbury Dana Yale University 1837-1892, Volume I: Elements, Sulfides, Sulfosalts, Oxides. John Wiley and Sons, Inc., New York. 7th edition, revised and enlarged: 650-651. Hey, M. (1962): Cobaltic hydroxide in nature. Mineral. Mag., 33, 253–259. Deliens, M. & Goethals, H. (1973): Polytypism of heterogenite. Mineral. Mag., 39, 152–157. American Mineralogist (1974): 59: 381. Deliens, M. (1974): Les oxydes hydratés de cobalt du Shaba méridional. Ann. Mus. R. Afr. Centr., Sc. Géol., 76, 1-80. Llorca, S. and P. Monchoux (1991): Supergene cobalt minerals from New Caledonia. Can. Mineral., 29, 149–161. Burlet, C., Goethals, H., Vanbrabant, Y. (2016): Delafossite structure of heterogenite polytypes (HCoO2) by Raman and infrared micro-spectroscopy. Spectrochimica Acta Part A: Molecular and Biomolecular Spectroscopy, 159, 90-97. The following Heterogenite specimens are currently listed for sale on minfind.com. Judy Rowe collection; Vera Munro-Smith (2006) Cobalt Mineralisation in Selected Australian Deposits. PhD thesis, University of Western Sydney. http://www.portergeo.com.au/database/mineinfo.asp?mineid=mn1486; Kazadi Banza, S. B. (2012). Structural geology of the Kinsevere copper deposit, DRC (MS thesis, University of Pretoria). Berbain, C., Favreau, G. & Aymar, J. (2005): Mines et minéraux des Pyrénées-Orientales et des Corbières, Association Française de Microminéralogie Ed., 22. Guitard, G. (2010): Catalogue raisonné de la collection de minéralogie régionale, C.E.R.P. de Tautavel, 143. Giovine, M., Gotelli, A., Grattarola, C., Ciriotti, M.E. (2005): Heterogenite al Monte Ramazzo, sulle alture di Genova. Micro (notizie mineralogiche) 4/2005: 65-70.
ⓘ Zuccarello (Rian Gianco) ? Pelloux, A. (1926) Res Ligusticae LVI. Sferocobaltite e altri minerali della valle del Neva. Annali del Museo Civico di Storia Naturale Giacomo Doria, 52 (1925-1928), 269-272; Antofilli, M., Borgo, E., Palenzona, A. (1985) I nostri minerali. Geologia e mineralogia in Liguria. II Edizione. SAGEP Editrice, Genova, 296 pp. Dr. Matsuo Nambu collection (curated by the Geological Survey of Japan); 南部松夫, 谷田勝俊, 北村強, & 桜井欽一. (1970). 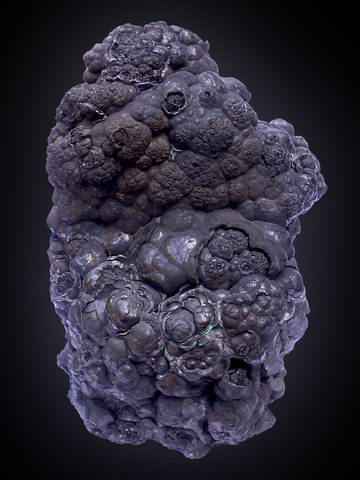 Heterogenite from Naganobori Mine, Yamaguchi Prefecture, Japan. 岩石鉱物鉱床学会誌, 64(2), 53-63. Stalder, H. A., Wagner, A., Graeser, S. and Stuker, P. (1998): "Mineralienlexikon der Schweiz", Wepf (Basel), p. 213-214.